My husband and my friend Marybeth. 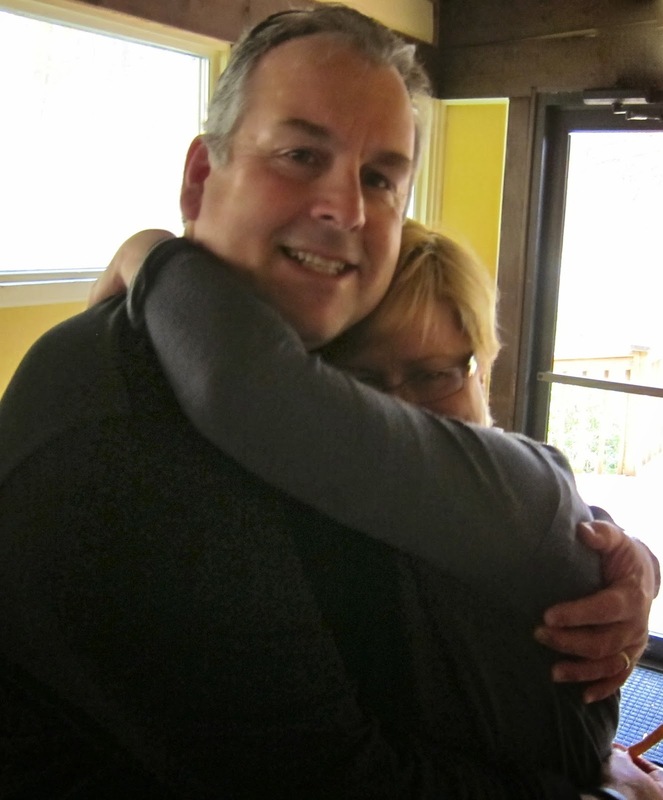 My friend Martha Frankel calls my husband The Friendliest Man on Earth. He wanders off when I’m with him to chat with strangers, while I sit and pretend to be involved in reading my menu or lately, my phone. Then he comes back and tells me he just met the guy who invented gum, or something equally interesting and outrageous. I wrote this as an assignment my teacher Abigail Thomas calls Two Pages. Her students write two pages on a theme she suggests. Often, the theme comes from a poem she shares with us; this one is inspired by the poem Litany, by Billy Collins. You are the one who chats with the man in front of you in line at the grocery store check out. I am the one who thinks every kind of store should have a self-checkout: tire stores, shoe stores, bakeries. You are the one who knows the names of the doorman and his kids. I am the one who knows the name of the doorman. You are the one who bumps into someone you know in almost every airport we pass through. I am the one who keeps my earbuds in, sometimes even without music in them, so I don’t have to talk to a single person at the airport. You are the one who takes 15 minutes to say goodbye. Even to the guy fixing the furnace. I am the one who waits in the car. You are the one who’s walking behind someone and notices their collar isn’t quite the way it’s supposed to be and gently fixes it, sometimes imperceptibly. I am the one who curses slow-walking shoppers. You are the one who volunteers to clean out my mom’s pantry after she dies and makes me an orphan, mostly because you’re nosy. I am the one who can’t bear to open its door. You are the one who cries when watching Grey’s Anatomy. I am the one who calls it High School Hospital. You are the one who calls my daughter to see how she sounds. I am the one who tracks your son online when he runs his first half marathon. You are the one who buys me a comb when I mention I can’t find mine. I am the one who frames a tiny picture of 9-year-old you and puts it on your desk. Kitty, this is so touching and funny. LOVE it. Really, really lovely, and hey, I know that guy and can see him your words. Wait–didn't you lose your comb in Chicago, too? Does Cuddy know? I am the one in awe of you both. Love all of these qualities in each of you! That was my pink brush. Thank you, Debbie. Maybe I should shave my head, now that I think about it. I laughed out loud at High School Hospital…very Kittyesque. That is one good man you've got there; the perfect compliment to wonderful you. makes a little money. Was thinking using the computer and writing would be fun! Thank you Terry! It’s been a very long journey to this website from teaching! But never dull. I’m a Kitty. With quiet bursts of Cuddy. ❤ back to you, Giznoodle.